Kempten, February 25, 2016. Dachser has created a new central organizational unit, Corporate Solutions, Research & Development, in order to advance its business with global, industry-specific logistics solutions and bundle its research and development activities. 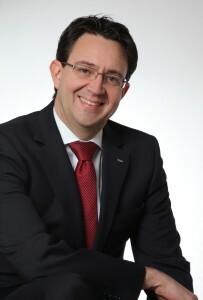 Stefan Hohm, an experienced Dachser manager, will head up this new Corporate Unit. He has led the Logistics Center in Hof for the past seven years. The 43-year-old Hohm and his team will implement worldwide supply chains for customers from focus industries. The new Corporate Unit will also bundle Dachser’s research and development activities and will be working closely with the Corporate Unit Corporate Development & Strategy, as well as with Corporate IT. Hohm will report directly to CEO Bernhard Simon. Responsibilities of the new unit also include new and continuing development of value-added services, which complement (upstream or downstream) transport and warehousing in the standardized Dachser groupage network. This includes dedicated services for special customers, industry-specific value-added services, and premium services associated with deliveries to end customers. Dachser has already established two industry-specific solutions in Europe: Dachser DIY Logistics and Dachser Chem-Logistics, which handle six million shipments annually. Ralf Meistes (DIY Logistics) and Michael Kriegel (Chem-Logistics) will continue to head these two departments, which, however, will be assigned to Corporate Solutions, Research & Development. Dachser is combining a great deal of industry expertise in this unit at the global level as well. For example, Dachser Air & Sea Logistics handles shipments for customers from the automotive, fashion, sports, pharmaceutical, and life sciences industries. Dachser, a family-owned company headquartered in Kempten, Germany, is one of the leading logistics providers. Dachser provides comprehensive transport logistics, warehousing, and customer-specific services in three business fields: Dachser Air & Sea Logistics and Dachser Road Logistics. 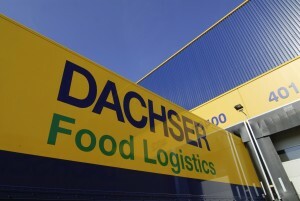 The latter is divided into two business lines, Dachser European Logistics and Dachser Food Logistics. Comprehensive contract logistics services and industry-specific solutions round out the company’s offerings. A seamless shipping network—both in Europe and overseas—and fully integrated IT systems provide for intelligent logistics solutions worldwide. With a staff of around 25,000 employees at 437 locations all over the globe, Dachser generated revenue of EUR 5.3 billion in 2014. The logistics provider moved a total of 73.7 million shipments weighing 35.4 million tons. Dachser now has country organizations in 42 countries. Winning awards in the categories “General load forwarding and groupage freight services” and “Food and consumer goods logistics,” DACHSER secures a double victory as the most successful logistics brand in the 2016 Image Ranking published by the „Verkehrsrundschau“ trade journal. Ninety-six percent of surveyed logistics decision-makers from the world of industry and commerce stated that a service provider’s reputation plays a significant role when it comes to awarding transport and logistics contracts. They also said that a logistics provider’s image is mainly determined by three factors: price-to-performance ratio, service quality, and customer service. Almost as important to buyers of logistics services these days is the issue of compliance—whether or not the hired service provider meets all government and company standards and provisions. „Verkehrsrundschau“ commissioned the market research firm Kleffmann (based in Lüdinghausen, Germany) to survey 400 logistics decision-makers from German companies in the world of industry and commerce (buyers of logistics services) regarding the image and name recognition of the 79 most important brands in five logistics market sectors. The resulting study, titled “Image Ranking for Transport and Logistics Services in 2016,” also rated the image of small and medium-sized freight forwarders operating regionally within the individual submarkets, as well as the reputation of the fifteen most important European logistics regions. 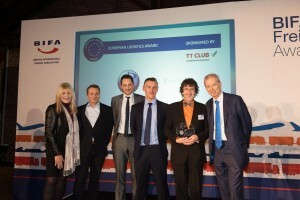 London – 4th February 2016: At the British International Freight Association (BIFA) Annual Awards Lunch in London last month, the global freight insurance specialist, TT Club presented the European Logistics Award to UK-based, independent freight forwarder The PSL Group. The Award attracted a wide-range of entries, which the panel of judges praised for their innovation and technical prowess. This year’s winner, The PSL Group is a multi-service global forwarder with strategically located offices throughout the UK. It provides a range of supply chain management and forwarding services to a variety of industry verticals including fashion, healthcare and publishing. Brian Sullivan, TT Club’s Development Director, in presenting the Award said, “TT Club is once more delighted to sponsor this Award and appreciates the role BIFA plays in encouraging best practice in the international freight and logistics industry. The judges were particularly impressed by the investment PSL made both in their staff and in quality systems to deliver a new rapid response offering”. The result is that PSL customers benefit from much faster turnaround times and the company has been able to generate new routes and new customers. As in recent years, TT Club and BIFA have found from the excellent entries for the Award that innovative technology is very important in advancing customer service, but what ultimately makes the difference is the investment that an organisation makes in its staff. IT solutions are employed in a tailored fashion to improve efficiency but, critically, the human touch has not been abandoned. In fact, an emphasis on stable personal relationships and effective customer service has proved crucial to success. “Perhaps the ‘human touch’ can become a modern day panacea for the operator searching for that elusive competitive edge,” concludes Sullivan. TT Club is certainly seeing more extensive services being provided by its customers. Many companies that in the past offered traditional freight forwarding now take on a much higher degree of supply chain risk and become exposed to greater liability by providing increasingly complex and sophisticated services. The trend is, however, seen as positive. The increased complexity of service offerings and the ingenuity of operators in designing alternative supply chain solutions strongly demonstrate the logisticians’ value and provide opportunities for new entrants as much as established logistics companies. The TT Club is the international transport and logistics industry’s leading provider of insurance and related risk management services. As a mutual insurer, the TT Club exists to provide its policyholders with benefits, which include specialist underwriting expertise, a world-wide office network providing claims management services, and first class risk management and loss prevention advice. The TT Club is managed by Thomas Miller. Kempten, February 4, 2016. Logifrio, the leading provider for temperature-controlled food transport on the Iberian Peninsula, is a n ew partner in the European Food Network. As a result, the European Food Network’s vivengo product family, the standard for transnational transport, is coming into its own for food shipments to and from Spain, Portugal, and Andorra. It offers various product lines with fixed transit times as well as defined information services, such as electronically available status information and proof of delivery for each shipment. The shortest transit time between pickup in Germany and delivery in Spain is two days. “The partnership with Logifrio is another important step in the development of the European Food Network,” explains Alfred Miller, Managing Director Dachser Food Logistics. With 30 of its own and partner-owned locations, Logifrio has a presence on the Spanish mainland, the Balearic and Canary Islands, Portugal, and Andorra, where upwards of 20,000 customers receive regular shipments of fresh and frozen food and shelf-stable goods. The family company, which is headquartered in Barcelona, owns 400 vehicles and has 115,000 square meters of warehouse space; it is certified in accordance with ISO 9001 and 14001. With its 600 employees, it generated EUR 64 million in revenue in 2014. With its 13 partners, 9 associate members, and regular line haul services among 29 European countries, the European Food Network is the most comprehensive network for food transport in Europe. This collaborative network, which was founded in 2013 under Dachser’s system leadership, has established itself successfully on the market. For example, export tonnage of groupage cargo transports by the network grew around 15 percent in 2015 compared to the previous year. Dachser, a family-owned company headquartered in Kempten, Germany, is one of the leading logistics providers. Dachser provides comprehensive transport logistics, warehousing, and customized services in two business fields: Dachser Air & Sea Logistics and Dachser Road Logistics. The latter is divided into two business lines, Dachser European Logistics and Dachser Food Logistics. Comprehensive contract logistics services and industry-specific solutions round out the company’s offerings. A seamless shipping network—both in Europe and overseas—and fully integrated IT systems provide for intelligent logistics solutions worldwide. With a staff of around 25,000 employees at 437 locations all over the globe, Dachser generated revenue of EUR 5.3 billion in 2014. The logistics provider moved a total of 73.7 million shipments weighing 35.4 million tons. Dachser now has organizations in 42 countries. 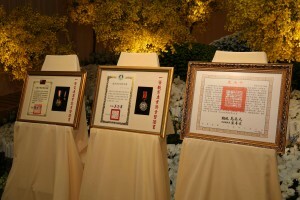 Triple posthumous honors were bestowed in recognition of Evergreen Group founder Dr. Chang Yung-Fa’s contributions at his memorial service in Taipei, including the Presidential Commendation, the First-Class Professional Education Medal from the Ministry of Education and the First-Class Professional Transportation Medal from the Ministry of Transportation and Communications (from right to left). Taipei, Taiwan (04 Feb 2016) – Taiwan President Ma Ying-jeou honored Evergreen Group founder Dr. Chang Yung-Fa with a posthumous commendation in recognition of his contributions to international transportation and social welfare during the memorial service today. Taiwan’s Education Minister and the Minister of Transportation and Communications also offered homage to Dr. Chang with the First-Class Professional Education Medal and First-Class Professional Transportation Medal. Evergreen Group is holding the memorial service for Dr. Chang at the Chang Yung-Fa Foundation in Taipei from January 27 through February 05. Thousands of mourners are coming from around the world to pay respects to Dr. Chang, including his close friends, government officials, representatives from business partners, shipping industry, aviation and travel trade in addition to Evergreen Group’s local employees and delegates from its overseas affiliates. Many more attending the memorial are among those who have benefited from Dr. Chang’s charitable work and generosity. Dr. Chang established Evergreen Marine Corporation in 1968. The global container carrier’s service network facilitated exports from East Asia and especially for Taiwan, an island that relies on foreign trade for economic development. The shipping line’s unprecedented success in launching Asia – Europe service opened the door to the booming European market for exporters in Taiwan and many parts of Asia. Evergreen’s cargo growth boosted Kaohsiung’s container throughput and enabled it to flourish as a main transshipment hub in Asia. Dr. Chang formed EVA Air in 1989. The airline’s innovative service has attracted international passengers and driven the growth of Taiwan’s travel industry. Now a Star Alliance member, the airline has won numerous awards for service excellence and flight safety from aviation and travel organizations. Its consistent recognition has helped promote Taiwan’s image in the global community. Besides, Evergreen Group has also diversified into aircraft maintenance, engine overhaul and manufacturing of aircraft parts, playing an important role in building up Taiwan’s burgeoning aviation supply chain. With its business expansion, Evergreen Group has set up overseas affiliates across a global network of more than 110 countries. These investments have driven growth and development for numerous related industries, including container shipping, aviation and hotels, etc. Evergreen’s steady growth over the past few decades has also enhanced Taiwan’s economic exchanges with other countries and paved the way for bilateral relations. Dr. Chang believed in giving back to society. In 1985, he founded the Chang Yung-Fa Foundation, an organization committed to providing emergency and medical aid, promoting education and culture and elevating moral standards. The Foundation formed the Evergreen Symphony Orchestra, launched Morals Monthly, a free magazine distributed in more than 30 countries, and also operates the Evergreen Maritime Museum, an institution dedicated to preserving maritime heritage. The honors now being bestowed on Dr. Chang posthumously are added to the accolades that he received over the course of his career from many countries across the globe, including the USA, Panama, Japan, Malaysia, the UK, France, Germany, Italy, Belgium, and the Netherlands. Kawasaki Kisen Kaisha, Ltd. (“K” Line) has decided during board meeting held today on changes of Executive Officers. Please see the attached list of responsibilities of Executive Officers scheduled on and after April 1, 2016. On behalf of our client Kawasaki Kisen Kaisha Ltd, (“K” Line) we are pleased to send you notification of their Financial Highlights for the 3rd quarter of F2015.